This twelve hour course is designed to allow students to delve a little deeper into the art of Thai Yoga Massage and perhaps help students decide if they wish to continue their studies with Metta River in longer trainings. You will learn a 60 minute form which will allow you to begin practicing this ancient art on friends and family. This course is great for Yoga students who wish to inform their practice with the art of touch and teachers who want to improve their ability to give adjustments in class. The teachers: Minga Lily has been studying Thai Massage and Thai Medicine for over 20 years. She grew up in Thailand until her teens when she moved to the U.S. for university. She has studied with her friend and Teacher Ashokananda (author of the art of Thai Massage), as well as world renowned teachers Pichet, and Chayut. 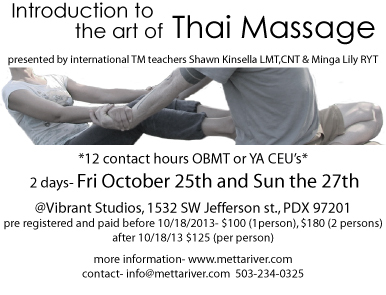 Shawn Kinsella began taking professional level trainings in Thai Massage in 2004 with Kam Thai Chow. In 2006 he completed his advanced trainings and received a teaching certification from Lotus Palm school of Thai Massage.